Many extras.. Backrest/Luggage Rack, Fender trim, Fender rail, Saddlebag guard, Saddlebag lid guard, Passenger Floor Boards, Highway Pegs, Flare windshield, etc. Thunder Stroke® 111: The Thunder Stroke® 111 engine delivers an incredible 119 ft-lbs of torque and features styling that pays tribute to legendary Indian Motorcycle® engines of the past. Hard Saddlebags: Spacious hard saddlebags are mounted on quick-release anchors and feature remote electronic locks you control with a console mounted button - or a convenient key fob. Windshield: Raise and lower the power-adjustable windshield with the push of a button to customize airflow and protection. High-output Audio: The fairing houses an audio system that delivers clean, quality sound from dual high-output speakers. The aerodynamic fairing blocks wind to allow you to enjoy your highway playlist without interference. Driving Lights: Driving lights provide both style and protection down any road you choose to take. Audio Bluetooth: The integrated Bluetooth® smart phone connection makes it easy to run music stored in the phone through the Indian® Chieftain® audio system. Playlist info is displayed on the multi-function display screen, and switches near the handgrip make it easy to control the audio. Bluetooth® is a registered trademark of Bluetooth Sig, Inc.
Keyless Ignition: Enjoy convenient and secure keyless starting. 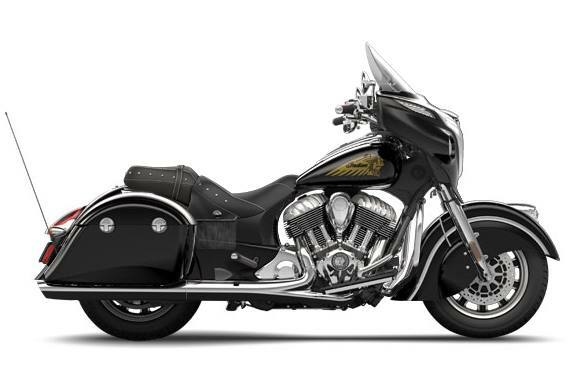 With the Indian® Chieftain® key fob in your pocket, climb on the bike, push a button and ride. If you misplace the fob, use the individual security code that you pre-programmed into the ignition. True Dual Exhaust: The engine produces a rich exhaust note from the true dual exhaust. The exhaust was acoustically engineered to eliminate high-pitched sounds, so what you really hear is Indian Motorcycle® thunder. Valenced Fenders: Stylish, elegant and functional, the iconic valenced fenders, standard since 1940, enhance the flowing styling lines of every Indian Motorcycle®. They also provide protection, effectively blocking road spray and gravel kicked up by the tires. Brake Caliper Covers: Every Indian Motorcycle® is equipped with outstanding brakes, and in keeping with our traditional styling, we choose to cover the calipers. The result is a clean, stylish, beautifully finished sheet metal - iconic Indian Motorcycle® valanced fenders. 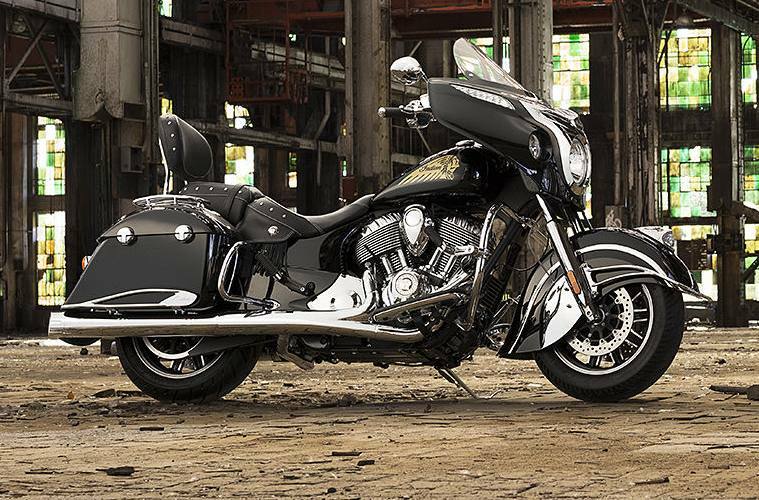 The First Indian Motorcycle of Its Kind: The 2015 Indian Chieftain maintains the legendary Indian Chief styling, while taking this progressive machine to new heights with advanced features and premium comfort. Exhaust: Add the Stage 1 Slip-On Exhaust and enjoy a rich, throaty exhaust note that provides the perfect soundtrack for the open road. This exhaust system allows the Thunder Stroke™ 111 motorcycle engine to breath more freely and unleash additional power and crisp throttle response. Add extra style to your exhaust with a set of Six Shooter Exhaust Tips. Performance: Boost the performance of your Indian® Motorcycle®, create more legroom on the left side of the engine, and enhance the style of the Thunder Stroke® 111 V-Twin. The “Big Sucker” intake lets the engine “inhale” more freely for a slight performance gain, and it enhances throttle response. Storage: Add style, comfort and outstanding storage space by installing a Trunk on your bike. The trunk has many luxury features and provides access to the cargo area, which is spacious enough to hold two full-face helmets. Passenger Comfort: A passenger will enjoy a comfortable, stable perch with these Passenger Floorboards. The strong metal base, with grooved rubber top, is hinged so the floorboards can be flipped up when not in use. Pinnacle Heel Shifter: The adjustable Chrome Heel Shifter adds extra style to your Indian® Motorcycle®, and it accommodates riders who prefer heel shifting.